Every now and then, good things can come from checking your Twitter account. The odd bon mot from the irrepressible Stephen Fry or, in this case, stumbling upon a little productivity gem. Pagico is the handiwork of a small development team based in Japan. The developers describe their product as ‘a comprehensive planner that manages notes, tasks, files, projects and contacts’. It supports individual planning as well as team collaboration and is available for Mac, Windows, Ubuntu, iPhone and iPad. The Pagico desktop app comes in three versions: people ($20), planner ($30) and professional ($50), with the website providing a clear overview of the respective features. There is a free 15-day trial. A licence for additional computers costs $5. The mobile versions are called Pagico Plus. For this review I have used the Pagico professional version 5.3 on an iMac running Mountain Lion and Pagico Plus 2 ($6.99) on an iPad 2. The iPhone version of Pagico Plus 2 will launch on 28 November 2012 and sell for $9.99. Be sure to check back here to read my follow-up review of the iPhone app. Using Pagico for team collaboration requires all participants to have the app installed. The team leader then creates a shared workspace for the team. A personal workspace that can be shared between three users costs $20. Individual users can avoid this one-time charge by purchasing the iPad app, which provides you with a free workspace. At the time of writing, a shared workspace for a six-person team cost $4.99 per month; this scales up to $49.99 per month for a 24-person team. See the Pagico website for further information about pricing structure and storage limits. Disclosure: the developers have provided me with a free version of the Pagico Professional Edition for purposes of this review. Type a project title and press ‘enter’ and you are up and running. I have set up a sample project based on setting up a small consulting business in Australia (see screenshot). To add notes, lists or files to your project you can click one of the ‘plus’ signs on the page, the helper app in the menu bar or use a keyboard shortcut to bring up a quick entry screen. 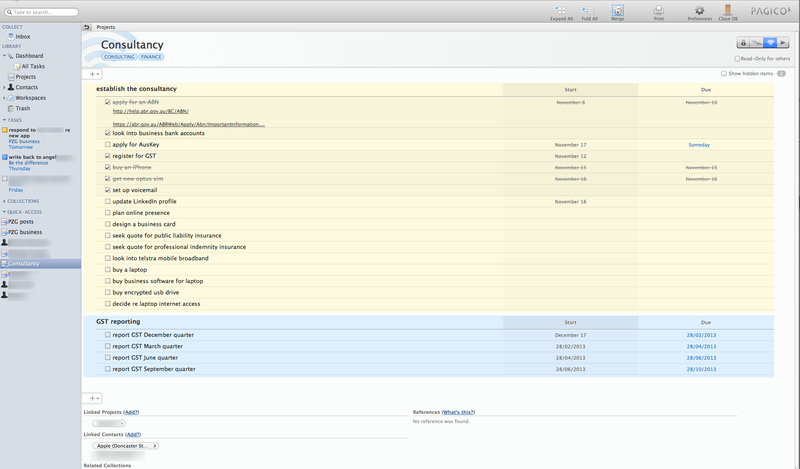 Lists in Pagico are containers of tasks, which can be colour-coded by the user, as in the screenshot. They can be collapsed or hidden and individual tasks can be reordered by drag and drop within a list, or dragged to another list within the same project. The Pagico project view in the desktop app. Pagico supports a wide variety of file formats, from the usual suspects (Pages, Numbers, Keynote, Word, Excel, PowerPoint) to Adobe, Photoshop, Scrivener, OmniOutliner and OmniGraffle files. These files can be dragged into a project folder, so that you have your project documentation and your action plan in one place. Files can be attached to a project or to individual list items. Pagico is very good at cross-linking all the information contained in the database: projects can be linked with contacts and vice versa. Like projects, contact profile pages in Pagico are containers that can hold various types of information: contact details, tasks, comments and files associated with that person. The versatility is fantastic and grants Pagico a customer relationship management dimension. The screenshot below shows a task list on the iPad app. The navigation pane on the left shows the folder icons for the dashboard view, inbox and project folder and a list of active projects. 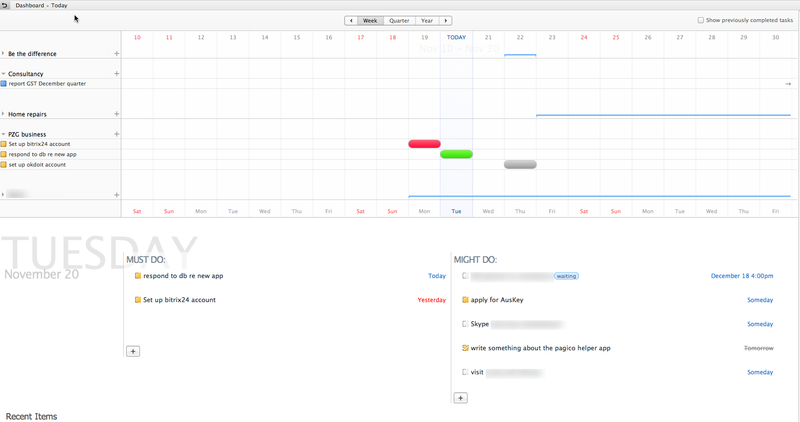 The Pagico dashboard view represents your upcoming scheduled tasks in a calendar view. You can adjust the timescale (week, quarter, year) and bring tasks forward or defer them by dragging and dropping. There is something therapeutic in pushing those vivid red lozenges to the right and watch them turn a friendly green or a sedate grey. The ‘dashboard’ view in Pagico’s desktop app. The iPad version calls this the ‘flowchart’ view. Do not be misled by the Gantt-chart-like appearance of the Pagico dashboard: this is a calendar-based, interactive visual representation of your upcoming tasks. While undoubtedly useful to visual thinkers, this is not your traditional project management software, as it does not allow you to allocate resources or weightings, or to create dependencies between tasks. Evernote: you can paste links to EN notes into the notes field of a Pagico list or task and launch Evernote from the app. Email integration: you can drag emails into the Pagico inbox. The dashboard provides a calendar view but you can also integrate your Pagico lists with ‘your favourite calendar program’ (includes iCal and Outlook; but I have not tried this feature yet). Quick and reliable synchronisation via Pagico’s workspace servers. Pagico has a number of features that support a task and project management approach based on David Allen’s Getting Things Done® (GTD®) framework. There is, for example, a centralised inbox; and Pagico makes it very easy to collect a wide range of information (including tasks, notes and files) and to organise it in projects. The dashboard view, as a visual representation of upcoming tasks, provides a useful system to facilitate a weekly review, as do the lists of scheduled, completed and ‘someday’ tasks. Pagico has been stable in my testing over the past four weeks — a prerequisite for any ‘trusted system’. While Pagico supports tagging (at project level), what is missing for me is a clear context view and the capacity to set reminders. Instead of ‘next actions’, Pagico distinguishes between ‘must do’, ‘might do’ and ‘someday’ tasks. Postscript: this app keeps getting better—read my review of Pagico 6 for desktops. This entry was posted in productivity and tagged calendar integration, CRM, evernote integration, iPad, pagico, productivity, project management, to do app by Gilbert Van Hoeydonck. Bookmark the permalink. Hi, you write about subtask and i use Pagico 6 but i dont understand how make a subtask, in terms of hierarchical task. 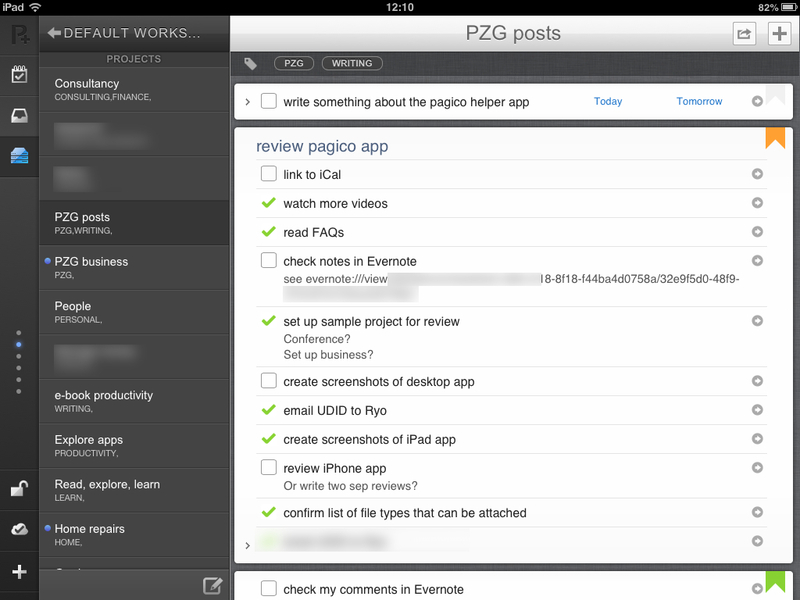 As you know, Pagico has three levels of hierarchy: project > task or list > list items. When I use the term ‘subtasks’, I am merely referring to Pagico’s list items, not to any hidden functionality:). I thought that would make more sense for non-Pagico users, who may have come across subtasks in other productivity apps. How do you integrate pagico with evernote on the desktop? If I drag an ever-note into pagico I get a web-link, not a link to fire up the note in the desktop version. Is that what I should expect, or is there a config in either app that I could change? Thank you for your comment. I know exactly what you mean – I get the same thing and find it quite frustrating when the Evernote browser version loads and requires sign-in when I am already happily using the desktop version. It appears to be an Evernote ‘feature’ – I get the same problem when I paste a note link into Omnifocus 2 or Things 2. With Omnifocus I was able to use a workaround by pasting the note link first into the note itself, making it a green, internal EN link. I was then able to paste the green link into OF 2; and following that link brought up the note in the desktop version of Evernote. Unfortunately this workaround did not work with Pagico. Advice, anyone?